My first memory of Auntie Diane was perhaps at the beginning of 1967; much earlier, and the moment would have been beyond memory; much later, and the occasion would not have have assumed the aura it still possesses. My aunt, her husband and my cousins were coming home on a visit – from Canada. In 1967, air travel was expensive, return visits by emigrants were rare. The occasion was such that it was deemed appropriate that we would all travel to London Airport to welcome them on their arrival. Trips to London Airport were almost as rare as flights across the Atlantic and the occasion was one approached with great excitement. One moment remains vivid, standing at a barrier in the bright light of the terminal building, watching people appear from a corridor. My aunt and her family appeared, my aunt with styled dark hair and a brown fur coat with which she withstood the chill of Ontario snows; my cousins in check shirts and patterned sweaters, smart North American winter attire. To a six year old boy from the country, their arrival was like that of film stars. In Somerset of the 1960s there were still people living in the pre-fabricated houses that provided homes to many people after the Second World War. The gap in wealth between North America and the England was wide, families across the Atlantic possessed wealth the likes of which we could only try to imagine. Old photographs reveal that Canadian affluence had reached the life of a small boy four years prior to the 1967 visit. 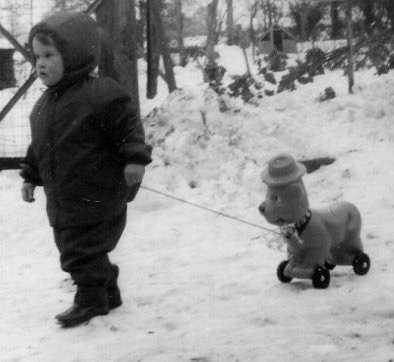 Among pictures from the severe winter at the beginning of 1963 are ones of a child pulling along a toy bear on wheels. North Americans would immediately recognise Smokey Bear, the figure used to educate the public about the danger of forest fires, a figure who made his first appearance in the United States in 1944. In later childhood, there was a sense of disappointment that the plastic orange figure on black wheels was not the much more famous Yogi Bear. Only when visiting Canada for the first time in the late-1990s did an awareness come of how significant Smokey and his campaigns had been and how widely he was recognised on both sides of the 49th Parallel. It isn’t just the plastic bear that points to the arrival of Canadian purchases, though. Looking at the picture, there came the realisation this evening, for the first time, that the two year old in the photograph is wearing a snowsuit. Such attire might be commonplace now, certainly among those who take children on package holidays skiing; in rural England of 1963, they would hardly have been plentiful. Photographs from the time show a child oblivious to the winter chill. It is not that he was ever a particularly cheerful child, it is that he is dressed for the minus thirty degree chill of Ontario. Auntie Diane’s presents still hold a place dear in his memory.